During November 2006, a trial excavation was conducted along the lower northwestern slopes of the western hill of Qazir, within the precincts of the ‘Ar‘ara and ‘Ar‘ara Southwest sites (Permit No. A-4954; map ref. NIG 209170–339/710281–618; OIG 159170–339/210281–618; Fig. 1), in the wake of development plans. 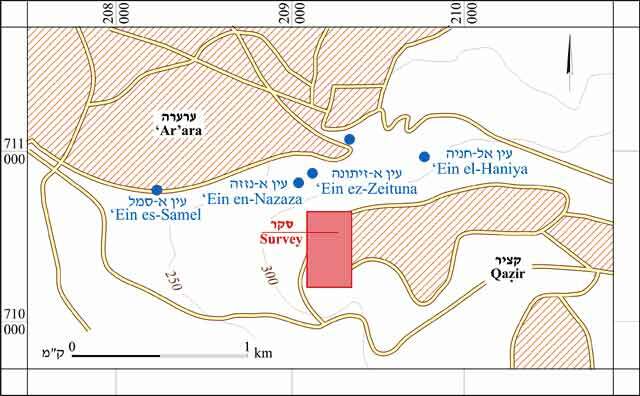 The excavation, undertaken on behalf of the Israel Antiquities Authority and underwritten by the Qazir-Harish local council, was directed by A. Gorzalczany, with the assistance of S. Mahajna and A. Massarwa (area supervision), M.A. 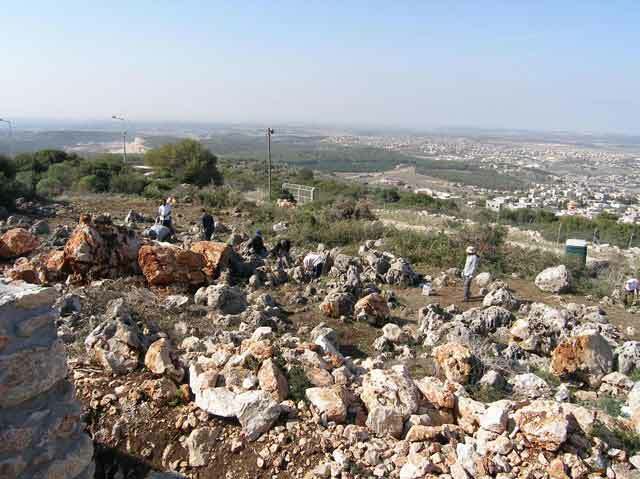 Tabar (preliminary survey, area supervision and assistance), S. Ya’aqov-Jam (administration), V. Essman and V. Pirsky (surveying), A. Dagot and L. Yihye (GPS), T. Sagiv (field photography), P. Gendelman (pottery reading), C. Hersch (pottery drawing), L. Ben Hamo (the Qazir Economic Development Company), L. Elbaz (project coordinator), A. Kabha (council surveyor), A. ‘Azav, K. Sari, M. Masarwa, A. Oren (IAA central region), A. Abu-Diab, M. Hasdiya and laborers from Tiberias. The remains are located along the eastern fringes of the El-Ahwat site (HA-ESI 110:32*–34*). The area, covered with rockfall and a tangle of thorny vegetation, enjoys excellent vantage points that lookout to the south, east and west (Fig. 2). At least five small artesian springs are currently located within a radius of several hundred meters from the site. 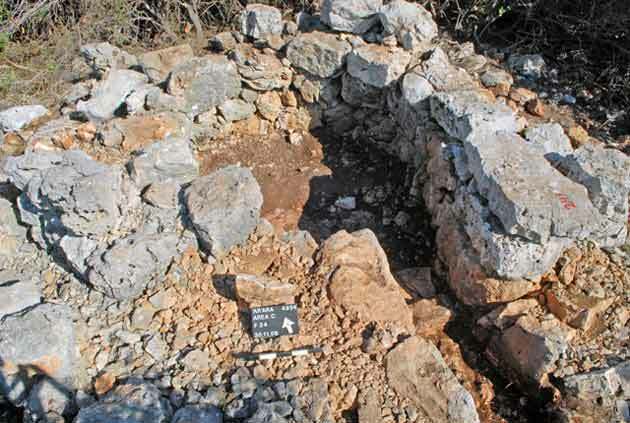 During a preliminary survey, 34 points were thought to be antiquities sites (Fig. 3). 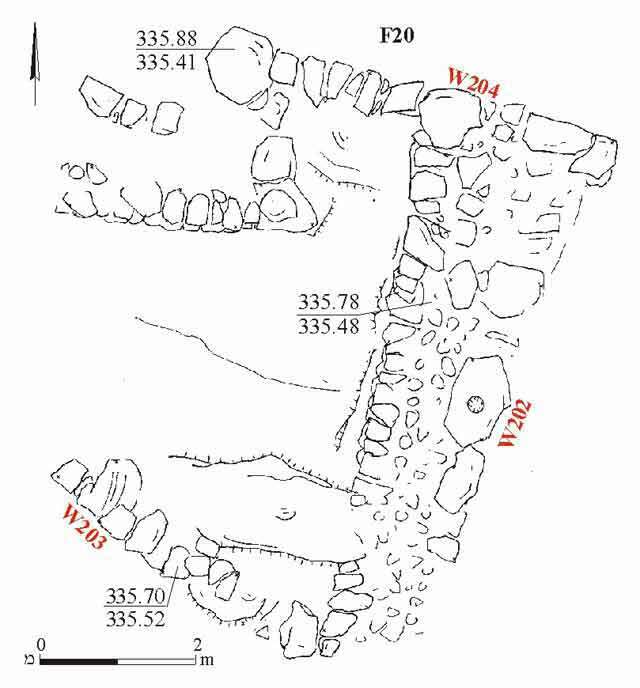 Three excavation areas (A–C) were initially opened and later, two of them (B, C) were consolidated into one. An agricultural region, which included farming terraces, buildings and watchman's huts that apparently dated to the Roman period (second–third centuries CE), was exposed. 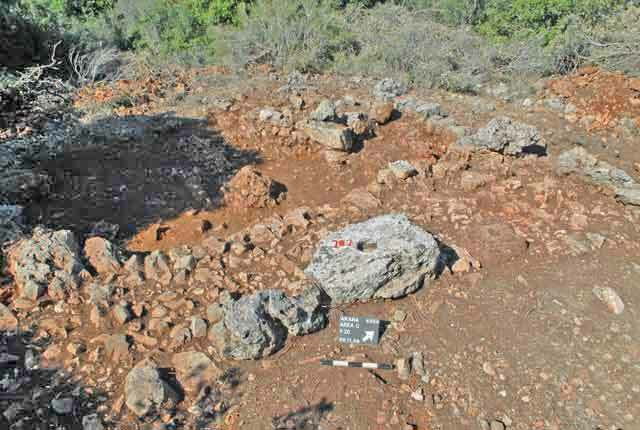 Four of six surveyed sites were excavated. 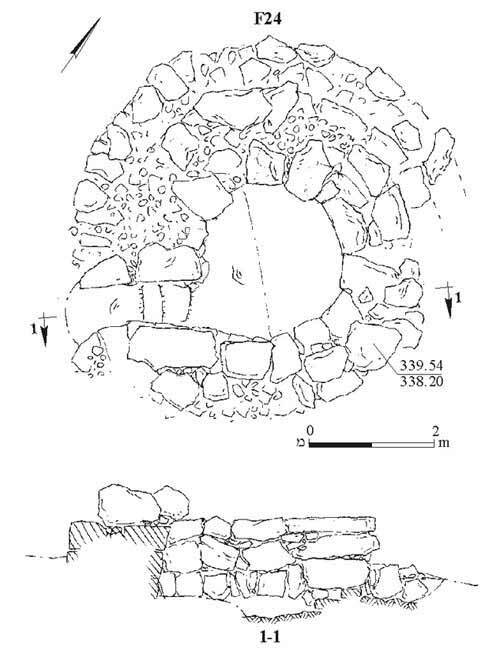 Circular stone installations and rows of well-arrayed stones that were poorly preserved, precluding the evaluation of their character, were exposed. The largest of the installations (F11; 2 × 4 m) was elliptical and founded on bedrock; a wall built of two rows of stones delimited its southern end. Another circular installation was smaller (F10; diam. c. 1.5 m), poorly preserved and also founded on bedrock. A circle of stones (F12; diam. 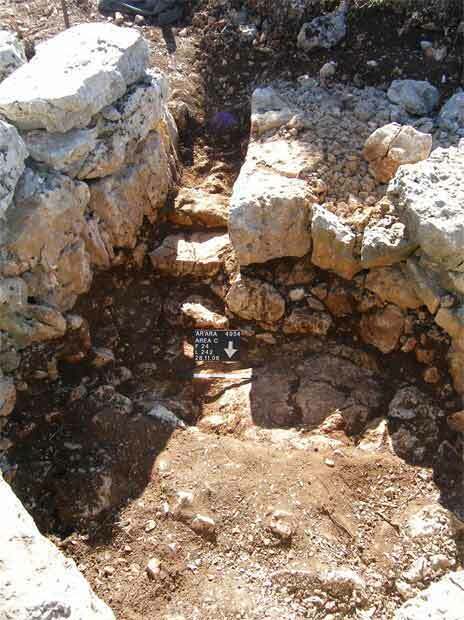 c. 2 m), surrounding an exposed bedrock surface and a similar installation (F13) that was found covered with the collapse of large stones, were discovered. The remains in these areas, located south of Area A, were better preserved. Five buildings and four watchman’s huts were excavated. The most prominent building in the area (F20; 6 × 7 m; Figs. 4, 5) was not completely exposed. The square structure was built of double inner walls (thickness c. 1.8 m) that consisted of large roughly hewn stones and a core of small stones. A stone with a round perforation was discerned in the eastern wall and was probably meant for hitching animals. Alongside the northern wall was a kind of corridor (length 2 m, width 1 m) that led to an exit, blocked by a row of stones. A few potsherds and jar rims from the second century CE were found in the building. A massive, north–south oriented wall that was preserved three courses high, had survived from a second large structure (F18; length 6 m). A third structure (F23) included built walls in the east and west (width c. 1 m), which were incorporated in the natural bedrock on the southern side; the northern wall was not preserved. The eastern wall (length 9 m, width 1 m) that curved toward the north was all that remained of the fourth building (F16), whose western part was destroyed. A small room (1.0 × 2.5 m) whose walls were founded on bedrock was preserved at the southern end of the building. A fifth round structure (F21; diam. 7 m) was not fully excavated but its plan could be traced. A probe (0.8 × 5.0 m) excavated in its southern part revealed several ribbed and worn potsherds that could not be dated. Several circular watchmen’s huts were exposed. One watchman’s hut (F24; diam. 6 m; Figs. 6–8), preserved four courses high and founded on bedrock, had a corbelled roof. The walls of an entrance corridor (length 2 m, width 0.7 m) in the southwestern side were built of large stones (max. dimension 0.5 × 0.6 × 1.0 m) and three steps were hewn in its floor. The other three watchman’s huts (F15, F17, F21) were reasonably well-preserved, but less than F24; all of them were incorporated in retaining walls or farming terraces. Watchman’s Hut 15 was incorporated in a wall (width 2 m) that was partly built and partly bedrock hewn. Similar structures, which were dated to the Iron Age, based on the small finds they contained, were discovered at El-Ahwat itself (HA-ESI 110). Yet, in other excavations in the region, they were dated to the Hellenistic, Roman, Byzantine and Early Islamic periods (‘Atiqot 55:83–107, 109–159 [Hebrew]; HA-ESI 110:31*–32*; HA-ESI 120), and even to the modern era (Z. Ron, The Watchman’s Hut as an Expression of Hilltop Farming in the Mountains of Judea and Samaria, Tel Aviv, 1976). The poor state of preservation, the damage caused by man and nature and the absence of datable finds make it difficult to date the complex and the agricultural installations. A number of ribbed potsherds, found above and below the floors of the buildings, included krater rims (Fig. 9:1–3), jars (Fig. 9:4–6) and a jug (Fig. 9:7) that dated to the second–third centuries CE, and the likes of which are known from nearby sites, such as Ramat Ha-Nadiv. Bearing in mind the nature of the complex and the limited extent of the excavation, it is suggested that the complex should be considered part of the agricultural hinterland of the nearby El-Ahwat site, at least during the Roman period. 2. View from the site, looking to the southwest. 5. Building 20, looking northwest. 6. Watchman's Hut 24, plan and section. 7. Watchman's Hut 24, looking north. 8. Watchman's Hut 24, steps in the entrance corridor, looking south.